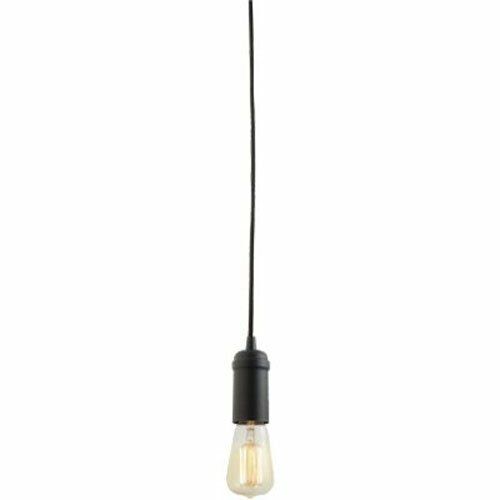 Globe Electric's simple matte black Edison 1-Light Plug-In Mini Pendant with a black cord is a great spin on a classic design. The exposed socket creates a modern industrial look. Pair it with a vintage inspired bulb for a unique design. Simple and inviting this piece is great for any space in your home. Hang it alone or pair it up to create a variety of different long lasting looks. The in-line on/off rocker switch makes using this pendant a breeze. Includes swag hooks for quick and easy installation and requires one 60W E26 light bulb (sold separately). Check out Globe Electric's assortment of designer vintage inspired bulbs to complete the look.